I created a cheerful card to brighten someone’s day. The card is gender-neutral so it is appropriate for anyone. 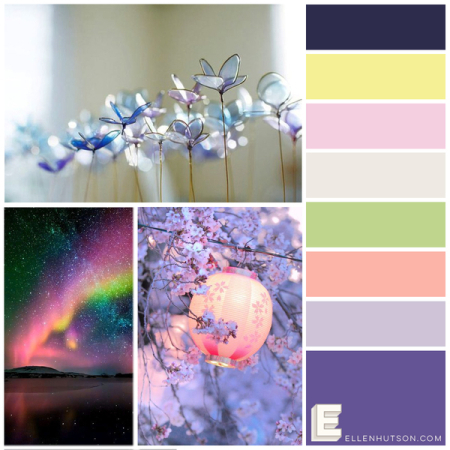 You can use different color palettes or combos depending on your own tastes or the tastes of the card recipient. I love cards that can be sent to anyone with just a few minor changes! The stamps and dies I used are all by Altenew. Though Altenew’s specialty are gorgeous floral stamps, they have some great graphic stamp sets as well. I used two of them to make this card (the name of the sets is listed below in the supply list). I used two colors in the same color family for this project. A light orange/coral to stamp the background and a darker orange/coral to stamp the small images over the dots of the background stamp. Hope you like this project. Smile and stay happy. Have a great day! Stamp the small images include in the background stamp set over the background dots. You can stagger the pattern of the images, use only a few images in the set. I chose to use the asterisk, scattered dots and flower images and alternated them across the dots in the following order: asterisk, scattered dots, flower. I repeated this across each row of dots and then started with the next image of my pattern on the next row of dots (e.g. if the row ended with an asterisk image, I started the next row with the scattered dots image and then continued with the pattern.). Stamp the speech bubble sentiments with the darker shade of orange/coral and die-cut them using the coordinating dies. If you don’t have the dies, then fussy-cut the speech bubbles. Adhere the speech bubbles to the background dots card front. Cut a 3.75-inch by 5-inch piece of fun foam to the back of the card front. This will give the card front added dimension. Mount the background piece onto a mat in the same tone as the darker ink. Adhere the entire card front to an A2 (4.25-inch by 5.5-inch) card base. Stamps: Altenew: Watercolor Dots background stamp set; Altenew: Speech Bubbles stamp set. Dies: Altenew: Speech Bubbles coordinating die set. Inks: Catherine Pooler Inks: Bellini (lighter orange/coral); Samba (darker orange/coral). Cardstock: Neenah Solar White 110# (card front and card base); Papertrey Ink: Berry Sorbet cardstock (mat). Winter is hanging on way to long! So, I hope this springtime bouquet is something you enjoy while waiting for more sun, and less snow and cold. Create a floral bouquet with some of your favorite floral stamp onto an A2-sized piece of white cardstock. (Note: use the largest floral stamps first and stamp them to form a floral arrangement with open spaces between them, then fill in the open spaces around the larger flower images with small ones or dots until the arrangement looks nice and full). Trim down the A2 floral card front to 1/8 inch on all sides so that the final size is 4.0” by 5.25”. Mat the floral card front to a piece of colored cardstock that picks up one of the main colors in the stamped floral arrangement. Mount the entire piece on to a horizontal A2 card base. Die-cut the sentiment 4 times from the same cardstock used to mat the floral arrangement. Adhere each of the 4 sentiment pieces together (I like to use liquid adhesive). Let the sentiment piece dry. Adhere the raised sentiment piece to a piece of vellum (I used micro-sized glue dots behind the sentiment). The vellum piece should be cut to a size slightly large than the die-cut sentiment. Adhere the vellum piece to the center of the card. (Note vellum was used behind the die-cut sentiment to make the sentiment stand out and mute the floral pattern behind it). Stamps: Concord and 9th: Peek Through Patterns (floral shapes); Concord & 9th: Love You, Mean It (tiny flowers and dots). Dies: WPlus9: Basic Greetings dies (‘smile’). Inks: Versafine Clair in Charming Pink, Glamorous, Purple Delight, Verdant, and Cheerful. Hope you like this project. Have a great day. Spring can’t be far away! 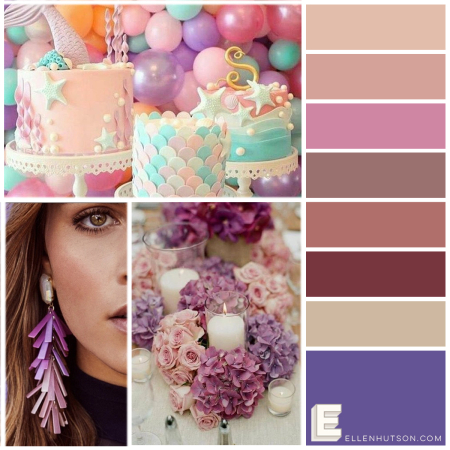 I love the various shades of soft pinks, mauves and taupes. They make for a very subtle, subdued, yet sophisticated color palette. The palette is also quite feminine. 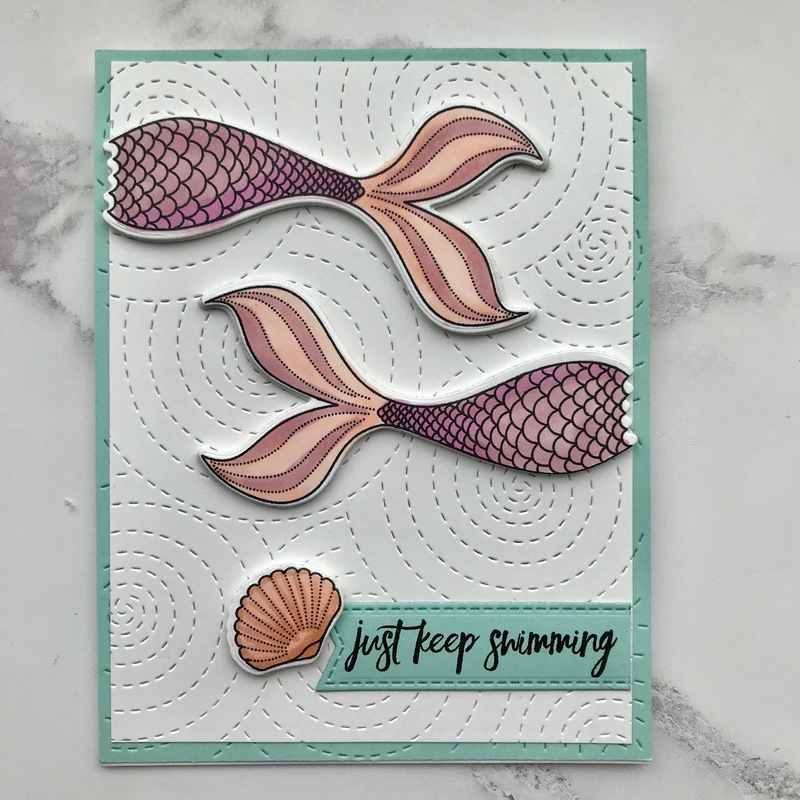 I decided to create a mermaid-themed card using graceful mermaid tales colored in pink and mauve tones with a touch of soft aqua for the sea. The delicate pinks and aqua decorations on the side of one of the birthday cakes also reminded me of the scales on the mermaid tails. So, my inspiration for the card was complete. Stamp two mermaid tails, and a seashell onto a piece of white cardstock using a Copic-friendly ink. Color the images with Copic markers (the colors are listed in the supply list below). Die-cut or fussy-cut all the colored images (the mermaid tails and seashell). Die-cut a banner using a stitched fishtail sentiment strip die from aqua cardstock. Using the quilted stitched spirals cover die, die-cut the pattern onto an A2-sized (4.25 inch by 5.5 inch) piece of aqua cardstock and an A2-sized piece of white cardstock. Trim the white cardstock piece down an eighth of an inch on all sides (final size will be 4 inches by 5.25 inches). Arrange the mermaid tails on to the trimmed piece of white cardstock. Stamp the sentiment onto the fishtail sentiment strip to the far left on the strip. Determine the placement of the aqua-colored stitched fishtail sentiment strip onto the white card front. The right side of the sentiment strip will be trimmed off once the placement is determined. Adhere double-sided adhesive foam tape to the mermaid tails and sea shell. Position all images and sentiment as show in the photo of the finished project and adhere them to the card front. Note: Before adhering the sentiment strip, trim of the excess strip so that the right end of the strip is flush to the white cardstock edge (refer to the final photo). Mount the finished card front onto an A2-sized card base. Stamps: Essentials by Ellen: Inner Mermaid stamp set (mermaid tail and seashell); Essentials by Ellen: Mermaid’s Tail (sentiment). Dies: Essentials by Ellen: Inner Mermaid coordinating dies (mermaid tail and seashell); Lil’ Inker Designs: Quilted Stitched Spiral cover die; My Favorite Things Die-namics: Stitched Fishtail Sentiment Strips (smallest one). Inks: Memento Tuxedo Black ink (Copic-friendly) for all the stamped images; Versafine pigment ink in Onyx Black for the sentiment. Copic Markers: Mermaid tail: R30, RV93; Mermaid body: RV93, RV63; Seashell R30, E13. 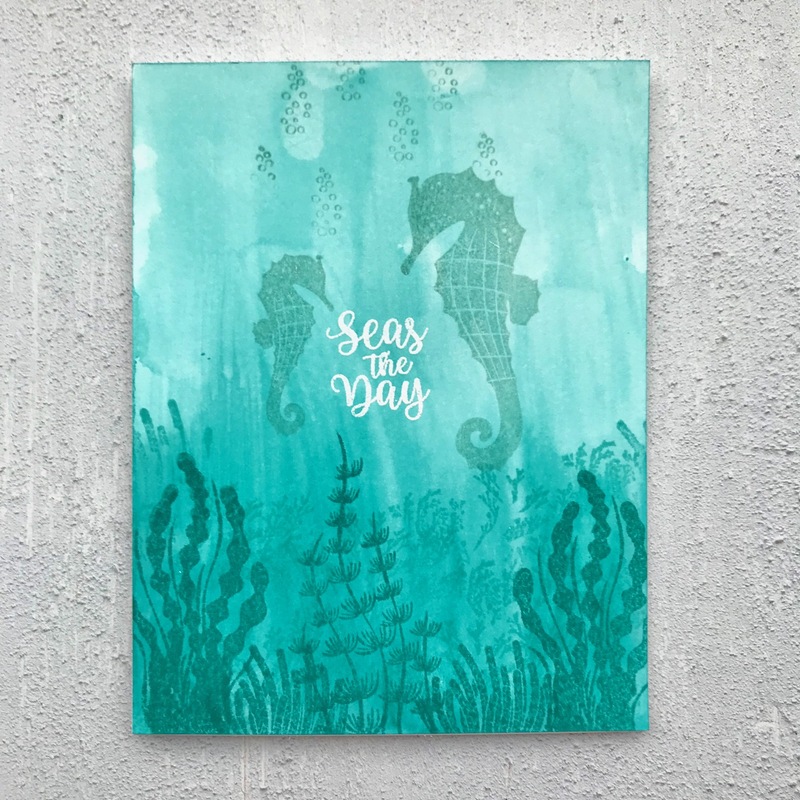 Cardstock: Neenah Solar White 80# cardstock (for stamped images and the white swirl-stitched cover-die mat); Papertrey Ink: Aqua Mist cardstock (for card mat and the sentiment strip); Neenah Solar White 110# (for the card base). 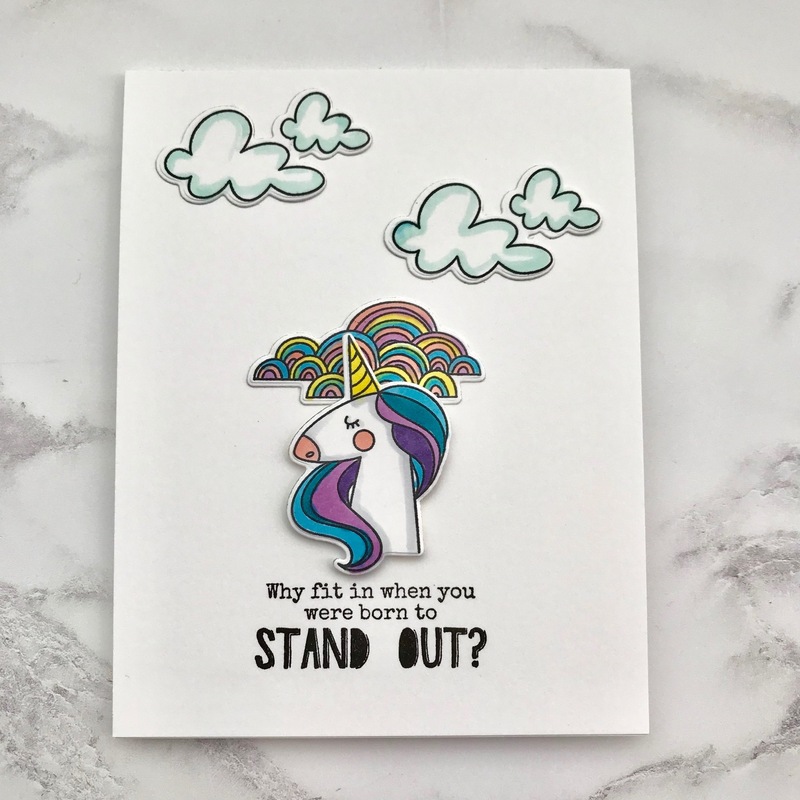 Don’t be shy, be a stand out, just like a unicorn. This unicorn is not a wall flower! So be like her, your magnificent self! Stamp images (unicorn, rainbow cluster and clouds) on Neenah Solar White 80# cardstock using a Copic-friendly ink such as Memento Tuxedo Black. Die-cut or fussy-cut all images. Arrange the images onto an A2 card front before stamping the sentiment to get an idea of where the sentiment should be placed. Stamp the sentiment once the placement has been decided. Adhere the clouds, rainbow cluster as shown. Place foam tape on the back of the unicorn image and place it slight lower, but over the rainbow cluster. Attach the completed card front to an A2 card base. Dies: Essentials by Ellen coordinating dies for Unicorns ‘N Rainbows stamp set. Inks: Memento Tuxedo Black ink (stamped images); VersaFine Onyx Black pigment ink (sentiment). Unicorn: R20 (cheek and nose); Y13 (horn); B02, BG07, V12, V17 (hair); C1 (shading on face & neck). Hope you like the project. Have a stand out day (or outstanding day)! I love seahorses. There is something about them that is graceful, calm, and quiet. This card was made using a technique demonstrated by Betsy Veldman on the Papertrey Ink blog’s Make It Monday feature. Her technique enables you to make quick and easy water-colored backgrounds. I adapted her technique by dragging the water color all the way down to the opposite edge of the watercolor cardstock using a wet flat brush. Her technique drags the wet brush about two-thirds of the way down the paper and then ends. I wanted to create an entire front panel of color which is lighter on the top, just like the light in the ocean as you get nearer to the surface of the water. I used Betsy’s technique as I mentioned above and then flipped the card front 180° so the lighter end was on top. I also worked the ink a little more than she suggested. Nevertheless, her technique produces beautiful results! I love Betsy Veldman’s demonstrations of techniques. She is such an artist. Thanks Betsy for the inspiration! View Betsy Veldman’s technique here: Papertrey’s Make it Monday #327 – Ombre Watercolor Backgrounds for the technique I used (modified a bit) to make the card front. Stamps: Papertrey Ink: Salt Air: Flora stamp set; Papertrey Ink: Salt Air: Fauna stamp set; Papertrey Ink: Salt Air sentiments. Inks: Papertrey Inks (darkest to lightest): Tropical Teal, Hawaiian Shores; Aqua Mist; Versamark ink for stamping the sentiment (later heat embossed). Cardstock: Tim Holtz Distress Watercolor cardstock (for card front); Neenah Solar White 110# (for card base). Other: Hero Arts: white embossing powder, foam ink blending tool. Hope you like this project and seas the day! I love hydrangeas and have been waiting to do my take on a hydrangea plant. I was intimidated by the cluster of small perfect flowers and how to color and shade them for variation. So here is my result. This project was also inspired by the current Ellen Hutson Pin-Sights Challenge. I took my inspiration from the flowers and the color palette. I chose the light purples (lavenders), soft yellow, soft green and a light touch of pale lilac to color the hydrangeas. All coloring was done using Copic markers. To make the flowers pop, I adhered them to a rich navy-colored piece of cardstock. I think the navy brought out the blues and made the pale color of the flowers pop. Stamped the hydrangea flowers and the cluster onto white cardstock using a Copic-friendly ink (Memento Tuxedo Black). Colored the flowers using the selected Copic marker colors (listed below in the supplies). Blending was very important since I wanted a soft look for the flowers. I started with the lightest BV0000, coloring each petal with this color to wet the flower and then added the other darker shades of the BV family for shading. I also added a little V12 (Pale Lilac) for a pinker, yet subtle, more vibrant look. I used BV01 and BV0000 for blending the colors together as well. Arranged the die-cut flowers onto the A2 navy cardstock. Let flowers overhang the A2 navy card front and trim them later, once the flower placement is the way you want it. Make sure to leave adequate room for the placement of a sentiment. Heat embossed the sentiment using gold embossing powder BEFORE you adhere the flowers to the card front. Placedfoam squares on the back of the flowers and place them on the navy card front in the placement that you’ve determined. Adhered the completed card front to a card base. Stamps: (all stamps by Ellen Hutson’s Essentials by Ellen stamp line): Mondo Hydrangea (flower images), Totally Random Sayings Vol. 2 (sentiment: ‘you really are’), Mondo Sakura (sentiment: ‘extraordinary’). Dies: Essentials by Ellen coordinating die set to Mondo Hydrangea stamp set. Inks: Versamark; Memento Tuxedo Black ink. Copic Markers: BV0000 (Pale Thistle), BV01 (Viola); BV13 (Hydrangea Blue), V12 (Pale Lilac) for flower petals; Y02 (Canary Yellow) for flower centers; YG11 (Mignonette) for flower stems. 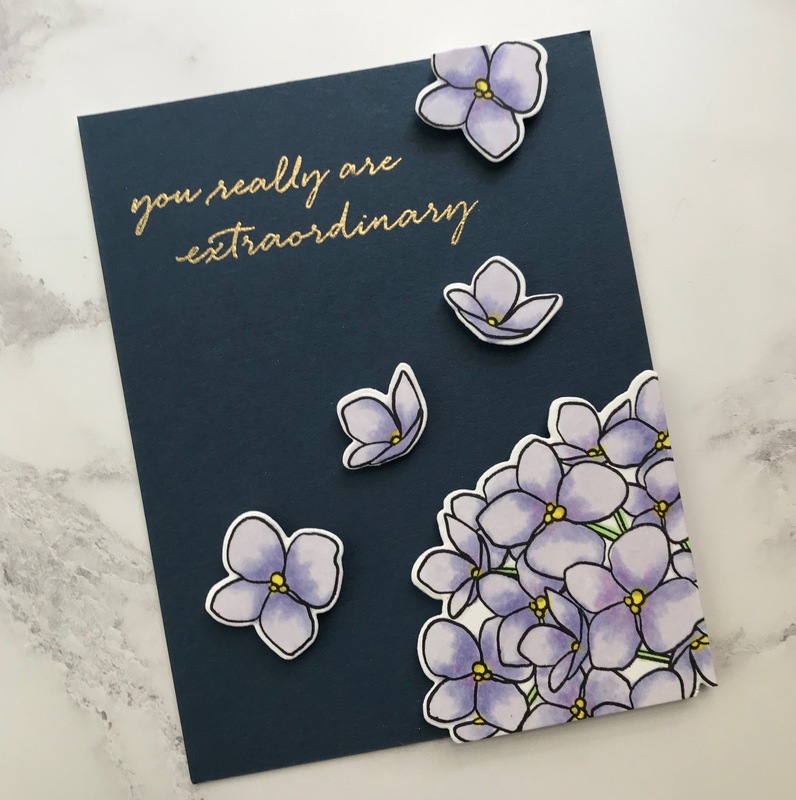 Cardstock: Neenah Solar White 80# (for stamping flower images); Papertrey Ink: Dark Indigo cardstock for card front mat; Neenah Solar White 110# for card base. Other: Brutus Monroe Metallic Embossing Powder in Gilded. 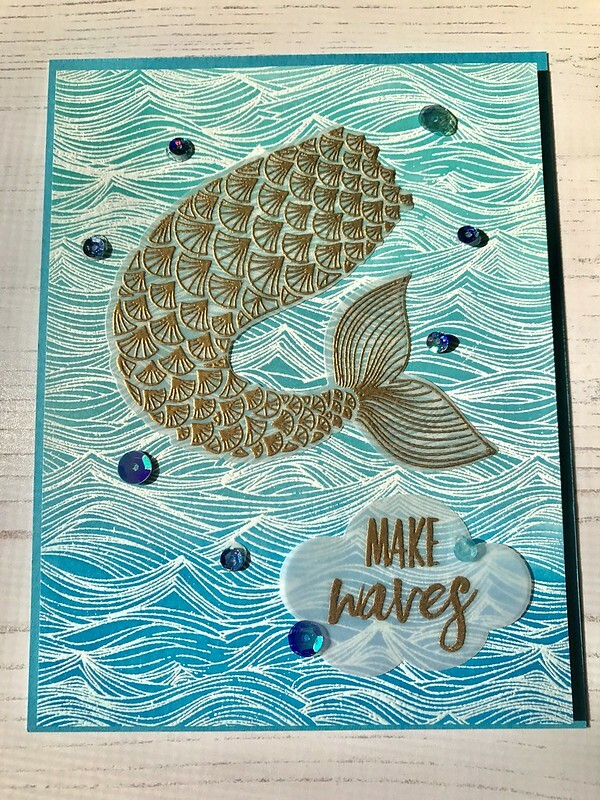 I made another card using images and a sentiment from the latest Essentials by Ellen stamp set Mermaid Tail’s. The details of the mermaid tail are so beautiful, that gold embossing is perfect for it! I wanted the gold embossed details of the mermaid tail to really show, so I used vellum instead of regular cardstock to give the image a transparent, light feel as if the image was floating on top of the water. Hope you liked this project and the effect I was trying to achieve. Remember, be like a mermaid and make waves! Prep an A2-sized piece of white cardstock with anti-static powder. Apply white embossing powder to stamped background and heat with a heat tool until melted. Let the embossed background cool. Using the embossed-resist technique, use 3 shades of blue ink to create an ombre effect from top to bottom. Blend the background as much as you need for the desired effect. Prep a piece of vellum cardstock (40# is best) with anti-static powder. Stamp the mermaid tail image onto the vellum using Versamark ink. Apply gold embossing powder to the stamped image and heat with a heat tool until melted. Let the embossed image cool before die-cutting (with coordinating die) or fussy-cutting it. You may want to put the vellum under a heavy book or block to flatten it after it has been heat embossed. Prep another piece of vellum cardstock with anti-static powder. Stamp the sentiment onto the vellum with Versamark ink. Apply gold embossing powder to the stamped sentiment and heat with a heat tool until melted. Using a small cloud image die, cut out the sentiment. Cut down the A2 wave background by an eighth of an inch on all sides. The final size of the wave background will be 4” x 5.25”. Cut out an A2-sized piece of turquoise or blue cardstock that complements the blue colors used in the wave background. This is the mat for the wave background. Adhere the wave background to the mat. (Note: For added dimension, you can adhere a piece of craft foam sheet cut slightly smaller than the wave background to the wave background and then adhere the card front to the mat). Apply a runner adhesive (not a wet adhesive) to the mermaid tail and adhere it to the card front. Do the same for the sentiment. (Note: the background is busy enough that runner adhesive will not be noticeable underneath the vellum). Adhere the entire card front to a top-folding A2 card base. Apply sequins to the card front as desired. Neenah Solar White 110# for the card base.